Sailing The Seas of Adventure! Developed by Camelot Games and published by Nintendo Golden Sun: The Lost Age is essentially cartridge 2 of the original Golden Sun title as both titles were originally supposed to be one game, but Camelot Games was unable to make the massive title fit in one GBA cartridge so they split the game in two. You can use the password system in the first title to transfer your save file to Golden Sun: The Lost Age which is a fantastic feature that even works in the Wii U Virtual Console version of the game! As for the story, Golden Sun: The Lost Age picks up where Golden Sun left off. The story actually feels much more epic this time around and many secrets are revealed about alchemy and the state of the world! Another unique story-related feature is that depending on your actions in the first game, some special story events may occur in Golden Sun: The Lost Age which is extremely cool as it connects the two games together as one single intertwined story! The gameplay is similar to the first Golden Sun title for the most part, but there are several additions to the formula! First of all after a certain point in the game you'll obtain a ship that'll allow you to travel the seas and explore the world. This ship will later be upgraded so it can fly, allowing you to reach even more places in the vast world of the game. The game features a ton of optional dungeons and some of these are quite challenging. Though the dungeons in general are far more difficult than the one's in the original Golden Sun title as the puzzles are at times extremely complex! The battle system is more or less the same as it was in Golden Sun, but there are a few changes. First you can now obtain new summons via. Summon Tablets from certain dungeons that allow you to utilize multi-elemental summons that are more powerful than their single-elemental counterparts! Some of these summons can be exceptionally difficult to obtain. The other new feature in combat is the switch system! At a certain point in the story your party will grow to a total of 8 members. You can switch members during combat or if all of your 4 member party dies the other 4 party members will jump in automatically which is a great feature when facing off against some of the stronger bosses in the game! 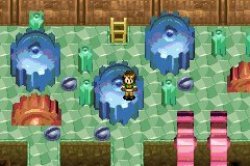 Golden Sun: The Lost Age also has a New Game+ feature that allows you to replay the game at an adjusted level of difficulty! You can choose whether the game is easier or more difficult and this will affect the stats of the enemies you'll face in battle during that playthrough of the game! The overall length of the game is incredible as well as it'll take most players 100+ hours to complete the game on top of the 80+ hours to complete the first Golden Sun title! The controls are really tight and are very easy to learn. 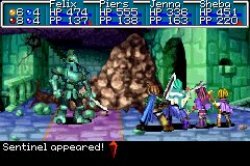 The graphics are also fantastic for a GBA title and The Lost Age appears to even be a little better than the first Golden Sun title visually! The graphics are a bit more crisp and clear. 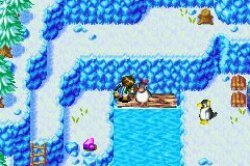 On the audio side of things, Golden Sun: The Lost Age is absolutely amazing, the sound effects are varied and sound great, and the soundtrack is one of the very best that we've ever heard from a GBA title! With top-notch gameplay with over 100 hours worth of gameplay, a fantastic story, excellent controls, and an unparalleled audio-visual presentation for a Gameboy Advance title, Golden Sun: The Lost Age is one game currently available on the Wii U Virtual Console service that every Wii U owner should have in their library of games! We give Golden Sun: The Lost Age a perfect level of recommendation! This game more than deserves its perfect score. Oh, the fun times I had playing this title over a decade ago...which I must admit I never actually finished. B-But I made it to Prox, and Mars Lighthouse and all that, so I ALMOST beat the game...almost! Excellent review! This is one of my favorite gba rpgs! Great review! When do you think we'll get the DS Golden Sun game on the eshop? @Trinity33 wrote: Great review! When do you think we'll get the DS Golden Sun game on the eshop? Hopefully soon. It's the one GS game I have yet to play. Wait a minute...GS...?! 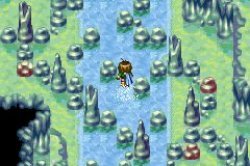 Celebi must appear in the first Golden Sun as the REAL Forest Guardian! Golden Sun is and always will be one of my favorite rpgs! Great review once again rukia! Good review. This was a day one download.